Tate Ornamental, Inc. works on projects that include stairways, railings, canopies, millwork, casework, stone and quartz. Our projects range from spiral stairs with wood treads and risers, monumental stairs with stone treads and risers, glass railings, wood wall panels, plastic laminate casework, and some of the most spectacular canopies you have ever seen. We service all industries ranging from Hospitality, Corporate Office, Governmental, Educational, Healthcare, Multifamily, Sport Venue, Retail, Commercial, Residential, Aviation, Industrial, Amusement Parks, and more. 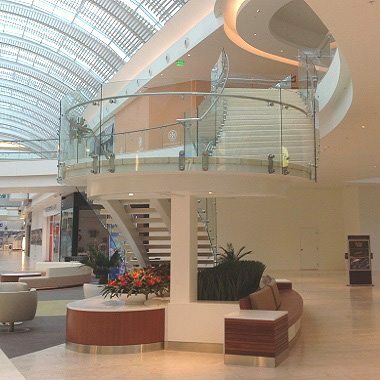 Located in Sarasota, Florida, this project gave us the opportunity to combine our 3 divisions (Metal, Millwork, Stone), in a beautifully designed mall. From pin-mounted glass guard rails with aluminum shoe and wooden grab rails, to radius millwork benches with Quartz tops/cladding and stainless steel base trim. It also enabled us to work with the wonderful, grain intense, exotic woods Wenge and Makore. As you walk through the concourse you will see Tate from every point of view. 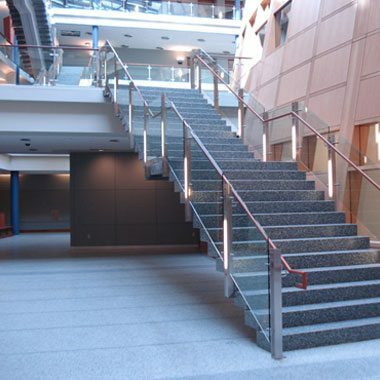 Other Metal Division items include glass floor planks and stainless steel cladding at bridges, glass guard rails with stainless steel grab rails at the monumental stairs and with aluminum shoe on the entire second floor, aluminum tree grates, and stainless steel base throughout. 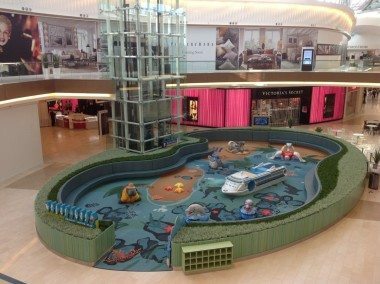 The Millwork Division fabricated several unique items including 47′ tall Makore veneer column wraps, a 62′ wide elliptical play court area with solid Makore and Corian walls and cushioned benches, and solid Makore at the Juliet balconies and planters. The customer service desk included Quartz & Makore veneer cladding and radius glass accents. The escalators were clad in Makore veneer panels and had Quartz tech tables and planters below. The Project Facilities area was outfitted with solid Wenge door jambs, stops, casing, & trim, Wenge veneer wall panels, and plastic laminate cabinets with quartz counter tops. The public restroom areas received our Quartz countertops/splashes with plastic laminate and stainless steel clad cabinets. Overall, a great project that utilized our expertise in Metal, Millwork, & Stone. This monolithic stringer stair located at Georgetown University includes column supports at the landings and includes granite treads. The stair features stainless steel lighted handrail posts supported by custom outriggers that attached to the stringer. The stair is complimented with a wood grab rail. The Richmond Marriott renovation located in Glen Allen, Virginia was tied to very important time constraints. This project required stainless steel, wood and granite to complete the design. Tate was able to supply all three of these components allowing the client to work with one subcontractor. We fabricated and installed the decorative wood and granite check-in counters. The cabinets were made from MDF and the interior and exterior surfaces were made using plastic laminate with absolute black stone tops. There were also three feature walls and computer pods made with wood veneer covered MDF, absolute black stone tops and three form decorative infill panels. The project expanded into the restaurant build out to include booth seating, TV stands located at each table, decorative columns, a breakfast bar and an exterior decorative trellis sun shade. The exposed steel and wood canopies we fabricated for this outdoor shopping center located in Greensboro, North Carolina include a radius design with laminated glass suspended with stainless steel spider fittings. It includes cable tie-backs to the brick, adjustable turn buckles, decorative rod supports and connections. We use Kynar paint on the metal canopy and glue laminated beams on the trellis.